..but I’m not too thrilled about it. I’m going to assume that they created it for Istanbul 2010 but I don’t love it. Stroll on over to http://www.google.com.tr/ to check it out! It is time for "Çizgili Günler"
Posted in Art, Events | Comments Off on It is time for "Çizgili Günler"
Posted in Art, Events | Comments Off on GepGenç in a week! 6th International Comedy Films Festival is in İstanbul between 23-27 November. The festival venues are Cinebonus Maçka G-Mall Cinemas, Beyoğlu Alkazar Cinemas and Institute Français d’Istanbul theatres. Ingmar Bergman films are being screened at İstanbul Modern (also other films of different genres). “The Next Big Thing” in town! Posted in Announcements, Art | Comments Off on “The Next Big Thing” in town! If you want to join this film-feast, please hurry up a bit because almost all tickets have been sold out yesterday-the first day tickets were offered for sale! 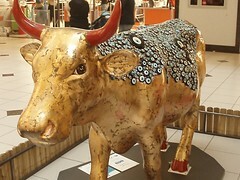 Have you seen the cows invade our lovely town? Beautifully decorated Cows are gracing the streets of Istanbul during the “Cow Parade” city expo. I remember seeing this expo a couple of years ago in Brussels so I think that it got here a bit late but better later than never. Its great to see everyone art being so available to everyone, it’s always a great success when people enjoy events like these so much. When you walk the streets of Taksim now a days, especially Istiklal, you might notice the various pieces of art positioned in remote locations that are on display and created by university students and artists. 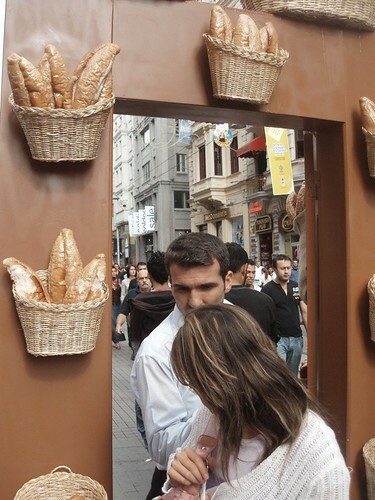 This piece here is the bread gate that is located on Istiklal, not far from Galatasaray.